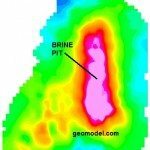 Using a variety of geophysical survey methods, GeoModel, Inc. can conduct landfill detection surveys to locate and delineate the extent of a landfill up to 50 feet deep. 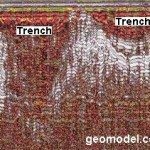 One of the methods that GeoModel, Inc. uses for buried landfill detection and burial trench location is an electromagnetic conductivity survey, also called terrain conductivity or EM survey. 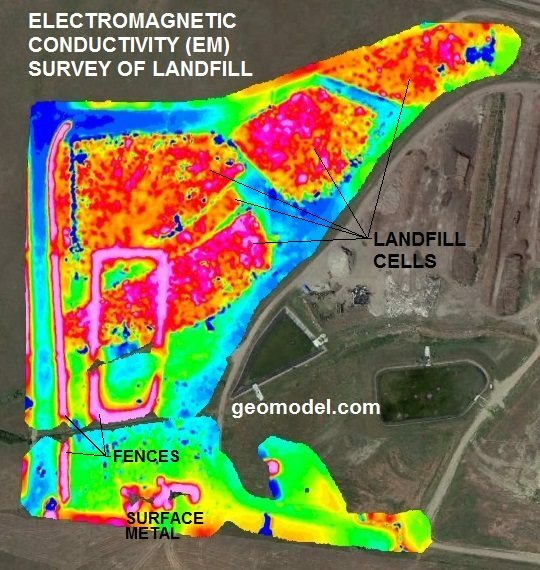 For landfill detection, electromagnetic conductivity can measure both the variations in ground conductivity and the amount of buried metal in a landfill or burial trench. Landfill detection, for areas where ground conductivity in landfill cells and burial trenches is low, can occur in areas that contain non-metallic construction debris. Ground conductivity in landfill cells and burial trenches can increase due to buried metal, such as steel drums, or due to high total dissolved solids or conductive groundwater impacts, making landfill detection relatively easy. 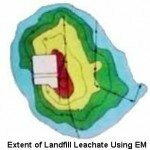 EM surveys can be useful for both landfill detection and for delineation of any conductive or inorganic groundwater impact plumes emanating from the landfill or burial trench and migrating downgradient of, and possibly offsite from, the landfill. 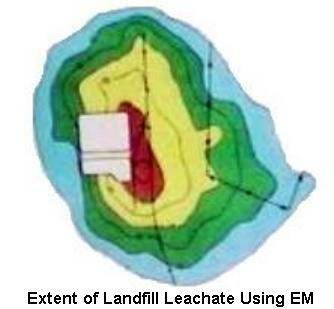 Results from an electromagnetic conductivity (EM) survey for landfill detection is shown below. The orange and red colors represent buried metal and high conductivity debris in the landfill cells and trenches. The blue and green colors represent lower conductivity areas outside of the landfill cells and trenches. 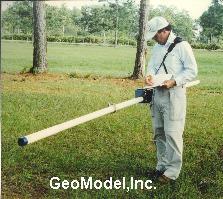 GeoModel, Inc. also uses ground penetrating radar (GPR) for landfill detection, and to detect waste pits and burial trenches. GPR utilizes an antenna (or transducer) to introduce signals into the ground that reflect from buried landfill materials and converts the signals into an image of the subsurface onto a field computer screen. 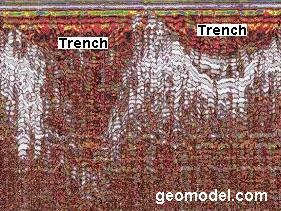 An example of a GPR profile showing two landfill burial trenches is shown below, along with an example of a color contour map from a landfill detection survey. 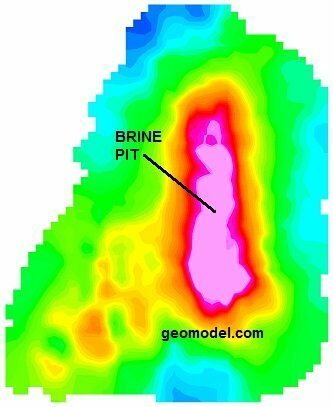 GPR images can assist in the determination of not only the extent of a landfill, but also the depth of landfill cells and burial trenches.